People in Uzbekistan's capital Tashkent are bidding farewell to the city's trams after local officials decided to take them out of service. The move to close the 90km (56-mile) network and sell its fleet of 80 trams was announced in March. 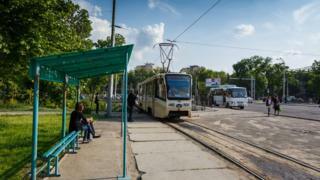 Tashkent mayor Rakhmonbek Usmavov said the trams were unprofitable and slowing down traffic on the city's busy roads. But many residents are lamenting the decision, and have taken to social media to mourn the loss of the trams. Uzbeks have been taking photos with the trams and sharing memes about the network. One woman told local media she took a photo of her son on a tram because she wanted him to have a memory of riding one. Mr Usmavov said trams no longer provided an effective means of transport, with thousands more passengers using the bus and metro networks instead. Removing the lines will allow the city to widen some of its roads to ease the congestion, he added. The city's tram service is one of the oldest in Central Asia, with the first line opening in 1912. Some social media users defended the system as a convenient and green way to travel, that took years and a lot of money to develop. Describing the trams as more than "just a mode of transport", many users said that without them, Tashkent would lose some of its character and distinctiveness. Umid Abdullaev posted: "Maybe in a couple of years, Tashkent's next authorities will realise that they made a big mistake and for the sake of the environment decide to rebuild tram rails and buy trams." Anna Yurtsevna lamented "It's a pity, my baby will never see a tram." Work to wind down the service began in 1999 but despite the gradual closure of lines, the city continued to acquire new stock from Russia and the Czech Republic. Some of the fleet is less than five years old. Aleksandr Nuyazin wrote: "The state has spent a lot of money for something ending after just five years? And nobody has been held responsible." "Idiots, they recently bought new trams for an average price of $300,000 [£200,000] per unit", posted Schastliviy Papa. The transport authorities said two major lines would stop operating in April, leaving Tashkent with only two tram lines which are scheduled to close in June. Dismantling of the whole system is scheduled for completion by August. Many residents took the opportunity to ride on the trams for one last time. One user posted an image of himself riding on a tram for what he said was his first and last time.